Just because you got people to read your headline doesn’t mean your job is done. Nor is your job done if they read the first sentence. Or the second. This article is a case in point. I might have hooked you with the headline … intrigued you with the first sentence … lured you with the second, third, and so on, until you and I meet right here, at the ninth. How about you and I undress one of the most powerful seducers of the written word … strip it down to essentials so you can use it to stop readers cold in their tracks, stir something in their souls, and keep them sailing through everything you write … whether it’s one hundred or one thousand words. Social media has had a dramatic impact on blog post headlines. Scroll through content sites like Mashable, Inc, Buzzfeed, or Bleacher Report, and you’ll realize the ultimate goal is to shock, surprise, titillate, or aggravate readers. Everybody wants to write a headline that goes viral … and it’s those headlines that get the lion’s share of social shares. This tendency has leaked into specific industries like SEO, content marketing, and conversion metrics … where the headline is a viral beauty, but the content is a hot mess of unorganized thoughts, shallow bullet points, and flat-out mediocre writing (even if it is epic in length). It’s a shame because I’ve found great information buried in some of these posts … only because I had a vested interest in digging deep. In other words, it was a willful act. But you don’t want people to read willfully. You want them to be carried away. If you want to write something that’s not only shared, but also read, then you need to make your content an act of desire. It has to be clear, concise, and compelling. And one of the ways to create compelling content is to use the Internal Cliffhanger. A cliffhanger is a scene in a book, movie, newspaper story, or TV show that holds something back from the reader or viewer. The promise is that if you keep reading or watching, you’ll eventually be rewarded with what you want to know. It’s the art of keeping your audience coming back for more. More than likely you’re familiar with the cliffhanger on the macro level, which is designed to keep a person emotionally connected to the content until the next post or episode is shipped. They are external to the content, like the buckle between two train cars. But there is another way to think about cliffhangers — on the micro level — better known as the internal cliffhanger. Internal cliffhangers stitch your story, article, or podcast together using emotions. These are statements and devices inside a piece of content that entice a reader to keep going. Think of them as mini-moments of seduction … the scraps of food you dribble out to lure the bunny rabbit into your house. In my story of Ingrid, her comments, winks, gestures, and emails to her husband were internal cliffhangers … smaller acts in a larger theater of seduction. Suspense is the main currency of cliffhangers. This is why mystery novels like Dan Brown’s The Da Vinci Code are irresistible. Or why we suffer through tedious commercial breaks to find out who’s behind the door. Curiosity: It’s what killed the cat. And the lone teenager at youth camp who thought she heard a noise in that abandoned cabin. But curiosity works on the intellectual level, too: Pentagon’s Humanoid Disaster-Rescue Robot Is Dressed to Impress. Challenges: Make a bold claim at the end of a paragraph that strikes people as audacious, and they’ll stick around to see if you can pull it off. Amazement: Set up the most ridiculous scenario you can and your readers will wonder: “Is he about to do what he suggests?” Think Cyclops getting ready to throw a chicken across the street. Pepper these internal cliffhangers through everything you write, and people will not only find it hard to stop reading, but will also beg for more. You can also use internal cliffhangers to answer a larger question through a series of smaller questions. A great example of this was in the book Why Does the World Exist? by Jim Holt. “With a mixture of metaphysical chutzpah and naiveté, these physicists – who include Stephen Hawking among their number – think they might be able to resolve a mystery heretofore considered untouchable by science.” That’s quite the challenge. “One can only hope it doesn’t turn out to be a bridge of asses.” There is Holt’s wit and humor. And Holt keeps it up throughout the book. It’s one of the reasons such a complex book about complex ideas is very readable. You want to work through it. You can also use dialogue to as an internal cliffhanger. Why? People like to read dialogue. We gravitate to the words on the page that are surrounded by quotation marks because we know that two humans are going to interact … and we’re drawn to it. Finally, you can use the ellipsis ( … ) as an internal cliffhanger. Ellipses gesture the reader to keep reading because the answer to their desire is about to be satisfied … which is hopefully what you’re after reading all 1,615 words in this article. But before you leave, do me a favor … and identify all of the internal cliffhangers I used in this post. Then listen to this short podcast episode called How to Use Internal Cliffhangers with Jerod Morris and Demian Farnworth. And don’t forget to subscribe to The Lede once you’re done! Next article: What’s the Best Way to Backup Your WordPress Website? Love the term ‘internal cliffhangers’. Many traditional copywriters recognize certain examples of these as the ‘bucket brigade’ technique or ‘grease-slide’ copy. For those not familiar with it, the term ‘bucket brigade’ comes from the idea of passing buckets from one person to the next to get water to a fire. So what you’re doing with your copy is continually passing the reader on from one paragraph to the next. Grease-slide copy is pretty self-explanatory, I guess. Whenever you see expressions in a blog, such as ‘So have we got that straight?’, ‘Here’s the problem …’ and ‘Why is this so?’ you know that the author is using a bucket brigade phrase. Well, just make sure you make a note of them in your own swipe file. And make sure you use them yourself. Thanks for the deeper insight into this, Demian. Great explanation, Carlton … and I do recall those phrases. Wasn’t “greased slide” Sugarman? And, just taking your points even further, there’s a big difference between the type of greased-slide copy you’d use in a classic Sugarman direct mail letter and that which you’d use in a blog post. I feel like I missed something in the conversation. I’m guessing based on some quick Google research that Sugarman = Joseph Sugarman, correct? Would you fellas recommend any title of his in particular? “Advertising Secrets of the Written Word” is a must. His Psychological Triggers is a good one, too. My All-time favorite book of his is The Adweek Copywriting Handbook: The Ultimate Guide to Writing Powerful Advertising and Marketing Copy from One of America’s Top Copywriters. He talks a lot about the “Slippery Slide” in this one. Once you have a reader’s attention you can’t assume you’ll keep it for the duration of your content. Attention spans are short, so if you want your longer content to work you need to make your audience want more with every sentence. Great post. You’ve got to work to keep people reading. If all you have is a strong headline, or strong first paragraph, that won’t be enough. These are all good ways to keep people going through that very last sentence. I could be here all day, so I’ll stop there and let others fill out the list. You should have also challenged people to go find internal cliffhangers in some of your past posts to see more of the technique in action. Copyblogger homework? Uh oh… the dog’s barking to go out. I’ll copy the post into Evernote and highlight the internal cliffhangers later. Okay, I counted 17 cliff hangers in this post (really, I read the whole thing). My take is that readers get the sense that what they are taking part in is a conversation… here’s what I mean. They get seduced when they feel the topic was written for them, you know, really addressing their needs. It is a common understanding of your reader’s question in a conversational tone that will get them to read the whole post and build credibility. Look at you go, Doug! And you right: keying into what the reader wants, cares about, fears will pull him along … and will feel like you are talking to her, and her alone. Yes, I agree with Doug. I like conversational blogs that sound like a real person having a chat with me. Anything that gets too commercial turns me off i.e. some style blogs start selling ads and doing sponsored posts then lose their honest feel. I run both a business and personal blog and these tips are great. I use cliffhangers to some degree but these pointers will just add some improved touches. good to see you talking about the fact it’s not all about SEO these days and how important CONTENT and QUALITY are over trying to hit a bunch of keywords. Great post Demian. It kind of reminds me of a quote I recently heard “When information is cheap, attention becomes expensive” –James Gleick – Way to much BS for folks to wade through these days, so much so that the good content sometimes has issues getting any real notice or reach as it gets lost in the noise. Thanks for sharing. Great point. I absolutely ADORE that photo. I checked Facebook four times while reading this (I just published a new post and it was getting some action)…but I came back. You had my curiosity. I was learning, growing, thinking, laughing. It was an emotional thrill. I also pictured the X-Men Cyclops hurling a chicken. Not sure if that was your intention, or if you’re going for the Greek variety, but I enjoyed the mental image. The Greek variety, but that’s the beauty of writing that doesn’t insult the reader’s intelligence … it allows them to use THEIR imagination. A great reminder that you gotta earn your reader’s attention every sentence along the way. I think bloggers need to be wary of overusing these kinds of tips too though–they can be overused to the point that they stop driving readership and push readers away by making your content feel too formulaic. I’ve stopped following blogs for this reason before. Yes, it should feel/read natural and native — never forced. I agree. It is important to write in a natural speaking tone. In addition, if you write about a topic that is important to your readers, they will keep reading and come back for more. That is true, even if your writing is sometimes a bit too formulaic. I was just reading about how to make sure your blog post is ready to go over at ProBlogger so it’s rather interesting you bring this up here. I think we’ve all fallen into the trap of spending so much time on our headline and then forgetting to keep the reader interested once they start reading, if they do. And you’ve given some great ideas on solving this with cliff hangers and so fourth. If the post is no good after the title, then the title is wrong in the first place, in my opinion. One of the biggest problems is the blogosphere is being overwhelmed by junk produced by a team of captive monkeys located in the lower wing of the Bit Intelligence Team Excelsior Meeting Expo. It is only made worse by the influence of the echo chamber that is created by bloggers who are unable or unwilling to come up with their own ideas so they produce posts that are virtually identical to a million others about how to become a better blogger. Some of these people would be better served with a lobotomy than a course in internal cliffhangers. At least they would have an excuse for their content. I remember when TV shows would present their season finales leaving you hanging over the summer of what was going to happen. There were many times when the storyline did not match the hype. The tagline plus the picture really got my attention. I can’t stop staring at that cowboy. I read the entire post waiting for the “a-ha moment” as it were; those last few common examples in the bulleted list. Very clever, indeed. JR also reeled me in, I have to admit. Fascinating. I actually started with the first sentence, continued to the second. Silly? No. Let me explain..
funny thing is that the first name to came to my mind when you introduced the “internal cliffhanger” was that of Dan Brown even before you mentioned it 🙂 I must confess that I’m aware of this powerful tool, but I’ve never considered implementing it into blog articles; it’s a great idea! Still, I think that you can pack it up, if you’re not gifted enough to attract the attention of the audience. It must be natural and a pleasure to read – like this article. Just read the Ingrid story you linked to. I have to say that was one of the most engaging posts I have ever read in the history of Copyblogger — don’t know how I missed it. My favorite internal cliff hanger = a great story. Especially a story where I feel like I’m in it. For example, I felt like Milton even though I’m in my early twenties and not yet married. You did a great job weaving useful copywriting info that was educating, fun and easy to consume. I like the fact that this post helps breakdown a key component of great writing. It’s all a part of mastering the craft. Indeed, and it takes time. I actually sat on the Ingrid story for about two years before it came together. Thank you for the kind words. It’s one of my favs, too. Great article, Demian! I see we share the same “passion” for good ole JR Ewing! You’re so right about the internal cliffhangers! Never thought of it this way! Very clever way of putting this idea forward! I have to say I was first intrigued when I saw JR and that title appear on my Facebook! Then, reading it made absolute sense! I often find myself getting caught by a particular title and then, the article is just EMPTY! Waste of time! You definitely have to keep the readers wanting more! I think I referred to writing an article like a screenwriter writes a movie once, so I suppose I was on the same wavelength as you here! No cliffhangers, not a good movie ( even in the “boring ones” you get little twists that can get you to watch them until the end)! Same applies to article writing! It is really a mess to lure readers with captivating caption only to lead them to none substantive content . I studied for a screenwriting MA a couple of years ago, and I find the more storytelling techniques I use in my copywriting – the more effective my copy becomes. I have understood your point. Using words in such a way that the attention of the readers is captured from the first sentence of the article to the last sentence. I read somewhere this quote and pondered over it, “Words are, of course, the most powerful drug used by mankind.” Words become drugs in that readers can be addicted to them, they’re eager to find out more and more information when the author uses internal Cliffhangers just the way you have explained. They’ll return to the blog or website to find out what new content has been published on it so as to read it. It is keeping the readers to be interested always. I’m a newbie copywriter, but I’m realising it’s more of an art than a science. I think good sales copy should impact and even imprint on a potential customer’s mind. Great post. Thanks for your contribution here and keep up the good work. I was deeply saddened by the news of his passing: such a talented actor. Yes, I agree: readers love to read dialogues. Many of us love decent quotes too. That is really a hook that can win you the game–no doubt about it. 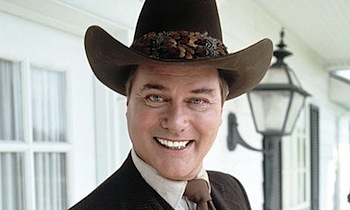 Larry Hagman was definitely a great cliffhanger!